gas oven and mine doesn't vent the steam, the bowl in the bottom of the oven works just fine for steaming bread for me, and my suggestion is your oven needs work, serious work! I don't have their web site, but when I have the money to send for it, that is what I'm getting the whole shebang, the stone,the steamer and the top which will run me over 200 and closer to 300 to have it sent to me. Although I still say your oven really needs work! As a Broetchen loving German I desperately tried to bake crisp German rolls like those I bought at home. Though there are hundreds of Broetchen recipes - every German region has different ones - with different shapes, made of different flours, and differently scored and decorated, the typical regular German Broetchen, whether it's called Rundstueck in Hamburg, Schrippe in Berlin or Semmel in Muenchen is made from white flour. High gluten, high protein bread flour makes, as somebody's in-law in this thread already suggested, a French type of crumb, lean and with holes. Broetchen crumb is soft and "fluffy", kind of loose, you can pull it easily out. European flours are different from American ones, for white breads and cakes Germans use wheat flour type 405. I found that for Broetchen recipes white pastry flour comes closest. I always work with a pate fermentee and overnight refrigeration - the taste is way better than with "Ruck-Zuck"- everything is ready in half an hour - methods. Though I achieved the "right" crumb, the "right" crust needs still some more experimenting. After coming out of the oven crusty, the rolls soften somewhat after a while. 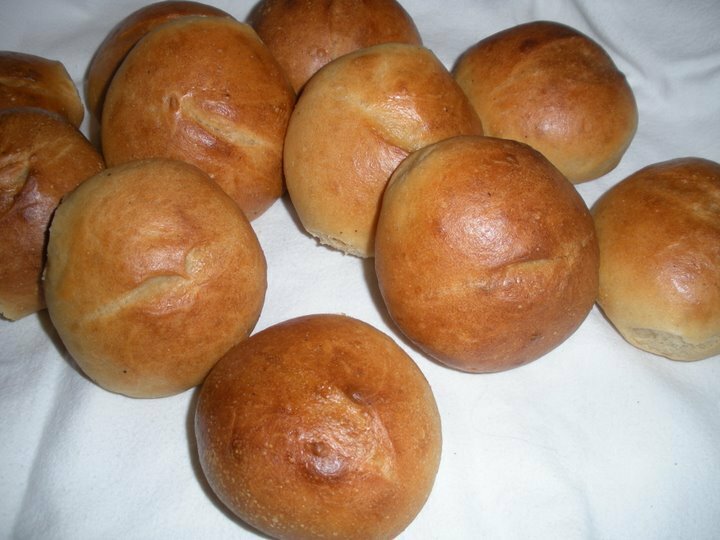 But if I freeze the rolls, thaw them and crisp them up at 400 F, sprayed with water, the crust is perfect. I agree that the "ruck-zuck"
I agree that the "ruck-zuck" style probably produces rolls that are also meant to be eaten "ruck-zuck" but what I like about the recipe are that the proportion of ingredients is perfect. You don't need to stick to the timeline. I made these yesterday, using half sifted home-milled flour (to remove most of the bran) and half white spelt. (working my way up to a greater wholemeal content). I made a pre-dough with the home-milled flour, hydrated with a little over half the liquid, as well as replacing half the yeast with sourdough (made out of bread flour). The pre-dough sat overnight and I turned the dough quite a few times over the 6 hours before baking. I baked them in a friend's oven (and got a better rise than in mine) and they are really delicious, soft and flavoursome. I've tried other bread roll dough and they just don't seem to work as well. I do think that for most rolls a soft flour is necessary to produce the soft crumb.